I’ve passed Noodles & Company in Downtown Royal Oak at least weekly since I moved to Michigan three and half years ago. I just assumed it was stereotypical semi-fast food chain and shrugged it off. But I’ve always been curious. After a friend made pan-fried noodles modeled after a Noodles & Company dish, I decided I had to give it a shot. Much to my surprise, what I got was both delicious and not horrible for me! Basically, there are five or six noodle dishes in three categories: American, Asian and Mediterranean, and a handful of soups and salads. For the noodle dishes, you can get either get a “regular” or small bowl. The small seemed like it would be plenty and it was. I got the Japanese pan-fried noodles and added tofu to it (I snagged the photo from PETA.org). Unfortunately, they forgot the tofu, but they quickly stir-fried some up when I realized it and I tossed it in. The noodles were thick and chewy, and a little crispy on the outside. The flavor was great with just a bit of a kick. The mung bean sprouts and fresh cilantro helped cool that off a little (but really it wasn’t very spicy, and I can only handle a good medium on most stuff). I got a small side salad too, which was Romaine lettuce and a few of vegetables and the balsamic vinaigrette was fine. I checked it out when I got home, and the noodle dish I got was only 320 calories on its own — the organic tofu adding another 100 calories. I’m not much of a calorie counter, but a dinner that’s around 400 calories and about 25 grams of protein isn’t bad. Not shocking, though, is that there’s a fair amount of sodium in the dish. Maybe that’s because there’s a bunch of soy sauce in this dish — as most of the Asian dishes there, if you look at the nutritional chart, seem to have about twice as much sodium as the rest of the menu (except for spaghetti and meatballs which tops the charts at nearly 1,500 grams). We got our food quickly and the staff was really friendly. I also think it’s kind of cool that they apparently get paid accordingly so they aren’t allowed to accept tips. I’ll definitely keep this place in mind the next time I need a quick, inexpensive meal when I’m running around in Royal Oak. Entry filed under: Metro Detroit, Northern Michigan, Restaurants, Southern Michigan, Southern U.S., Uncategorized. 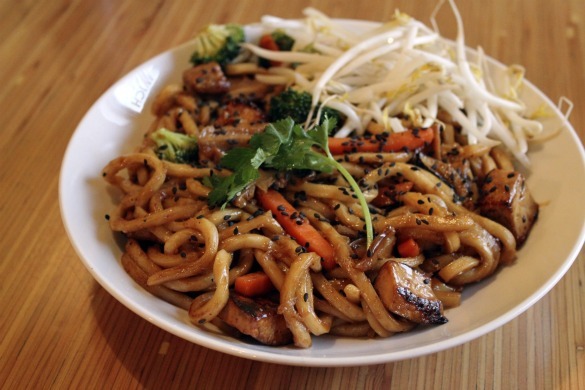 Tags: asian, fast food, fast takeout, noodles, Noodles & Company, restaurant, restaurant food.